Physics Discovery: Construct 12 models and conduct experiments with them to learn about forces and simple machines. Each model demonstrates a fundamental idea in mechanical physics. Building projects include a balance scale, freight elevator, spinning motion picture, spring scale, waterwheel, and rubber-band powered dragster. The 48 page book offers illustrated instructions for the building projects and experiments. 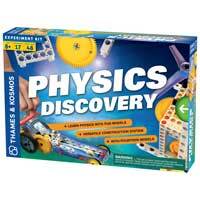 Physics Discovery uses parts that are compatible with all of our Physics and construction kits. Each model demonstrates a fundamental idea in mechanical physics.